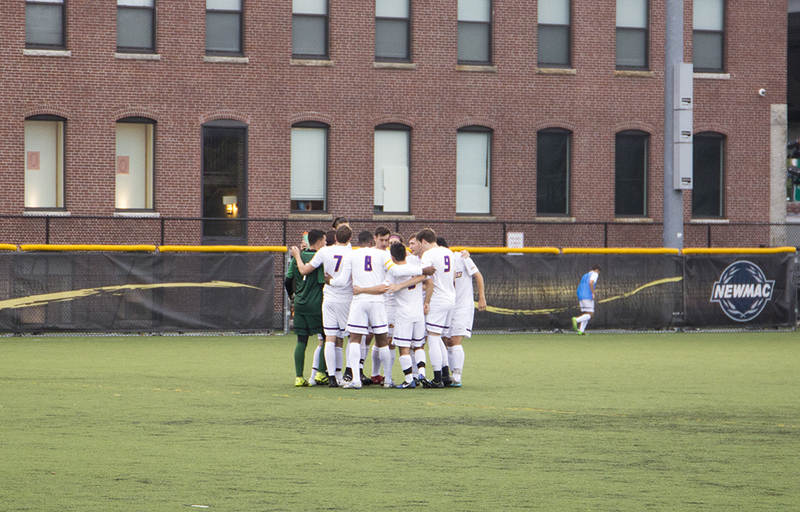 Men’s soccer pulled out a NEWMAC win in its final game. Men’s soccer head coach Bryan Harkin set a lofty goal to make the NEWMAC playoffs with his team this season, but the Lions finished far from it. The Lions finished with an overall record of 5-10-2, a conference record of 1-6, and a nonconference record of 4-4-2. They finished last in the NEWMAC. Harkin said the root of their struggles came from an inability to finish games. While defense was a problem for the Lions—they averaged 2.29 goals against per game—the team also struggled with its offense. They only scored twice in the NEWMAC, and Harkin said they were too reliant on their sophomore leading scorer Gavin Faucette. Faucette led the team with eight goals and 16 points this season. He finished first in shots in the NEWMAC with 68. The team concluded its season on a high note by defeating MIT 1-0 in its season finale on Oct. 28th to claim their only conference win. Senior Franco Araujo O’Neill scored the winning goal for the Lions, and fellow senior Niko Emack-Bazelais assisted. Senior goalkeeper Lucas Fischer made six saves and earned a shutout in his final game. Harkin was also glad that the team earned its first conference win, but he said he still expects more. Harkin’s ambition has players like Fischer excited for the future, even though Fischer is graduating. Fischer said the young players, particularly the freshmen, showed promise. Two freshmen, James Suvak and John Manocchia, played in all of the Lions’ games, while freshman goalkeeper David Kemp started six games and had a record of 3-2-1. Four of Kemp’s starts came when Fischer was out with a concussion, and he went 2-2 during that stretch. Kemp said he believes the squad will become a playoff contender while he is at Emerson. The Lions will graduate five seniors this year: Warren Backman, Marco Correia, Fischer, Araujo, and Emack-Bazelais. They all served as key figures on Harkin’s squad. While Harkin said losing these players is hard, it is part of life as a college coach.